Executive Mosaic’s GovCon Index swung to negative territory in a volatile afternoon session for U.S. stocks Friday as equities retreated from morning gains after reports surfaced that China’s navy seized a U.S. unmanned underwater drone in the South China Sea. The GovCon Index’s streak of five consecutive weekly gains also ended Friday but the GCI has climbed 10.74 percent since the Nov. 8 election win by Donald Trump, who pledged in his campaign to increase defense spending. GovCon Index gainers outnumbered decliners by a 2-to-1 ratio as three of its 11 S&P 500 components advanced with Boeing (NYSE: BA) the top net gainer and Harris Corp. (NYSE: HRS) the largest laggard among co-listed companies. 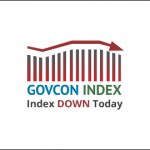 Four GovCon Index stocks shed at least $1.00: CGI, Navistar International (NYSE: NAV), CACI International (NYSE: CACI) and Harris Corp. (NYSE: HRS). Investor activity swirled around Honeywell (NYSE: HON) as the GCI’s most-actively traded stock after the global aerospace and industrial conglomerate reaffirmed its fourth quarter earnings forecast of $1.74 per share to fall below the $1.75 analyst consensus. Honeywell’s stock opened down 2.61 percent but recovered to close up 4 cents, while volume totaled 5.7 million shares traded versus the three-month average of 3.89 million. Honeywell also issued initial 2017 guidance that sees earnings per share of $6.85-$7.10 versus the $7.08 analyst consensus on revenue in the range of a 1-percent decline to a 2-percent increase. Wall Street’s 2017 sales forecast of $39.9 billion indicates an estimated 1.01-percent increase over the 2016 consensus of $39.5 billion. Huntington Ingalls Industries (NYSE: HII) led all GCI net gainers for a second straight session after the U.S. Navy said its latest Force Structure Assessment plan the branch needs to expand to as many as 355 ships over the next 30 years, a number Bloomberg reported is in line with Trump’s plan. Bloomberg’s Anthony Capaccio listed HII and its rival shipbuilder General Dynamics (NYSE: GD) as contractors that could see sales increases under the plan along with Raytheon (NYSE: RTN) which builds electronic combat systems and the Air and Missile Defense Radar. The Navy had previously set a goal to increase its fleet size from the current 272 to 308. General Dynamics closed fifth for GCI net gainers as other top five performers outside of GD and Huntington Ingalls included Orbital ATK (NYSE: OA), Boeing (NYSE: BA) and BAE Systems PLC, which trades over-the-counter in the U.S.
Utility stocks led seven S&P 500 sectors higher with technology the largest decliner among the remaining four as the U.S. stock bellwether gave back a gain of roughly 0.2 percent in the morning session to end lower for the week.